Great Britain have won two medals on the opening day of the UCI Track Cycling World Cup in Hong Kong. 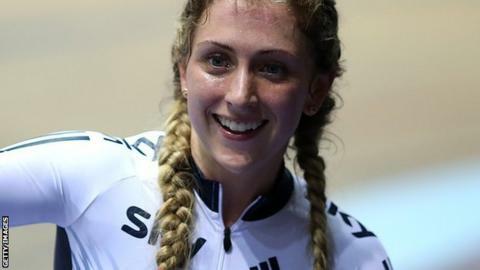 Laura Trott took silver in the scratch race and Wales' Emily Nelson, 19, won her first World Cup medal with bronze in the points event. Two more British medals are guaranteed after the men's and women's sprint teams qualified for the gold races. The men - featuring Jason Kenny, Philip Hindes and Matt Crampton - will take on Poland in Saturday's final. Katy Marchant and Jess Varnish face Russia in the women's sprint final. Trott won the scratch silver medal ahead of Chinese competitor Qianyu Yang, with gold going to Belarusian Marina Shmayankova. Lichfield rider Nelson scored 11 points in her event, finishing behind Belgian gold-medal winner Jolien d'Hoore and Canadian silver medallist Jasmin Glaesser. In the women's team pursuit, GB were fastest in qualifying, with Trott, Elinor Barker, Ciara Horne and Joanna Rowsell-Shand registering a time of four minutes 19.369 seconds. And in the men's team pursuit former road race world champion Mark Cavendish raced on the track in a World Cup jersey for the first time in nearly seven years, helping Britain finish sixth and qualify to face the Netherlands in round one. They qualified despite Kian Emadi suffering a puncture and crashing out. Cavendish, who is hoping to qualify for the Rio Olympics on the track, is also racing in the omnium.